Automotive Innovations, your adaptive dealer, is proud to represent Vantage Mobility International's line of Ricon personal mobility wheelchair lifts. Using the industry's best-in-class manufacturing facility, VMI delivers the highest quality platform lifts for vans, designed to meet a variety of needs and budgets. VMI Ricon wheelchair lifts have been developed for optimum strength and convenience and feature the most current technology available to ensure your complete satisfaction. VMI Ricon wheelchair lifts can make almost any full size van a wheelchair accessible van. Using the industry's best-in-class manufacturing facility, VMI delivers the highest quality platform lifts for vans, designed to meet a variety of needs and budgets. VMI wheelchair platform lifts have been developed for optimum strength and convenience and feature the most current technology available to ensure your complete satisfaction. VMI platform wheelchair lifts can make almost any full-size van or smaller global van a handicap accessible van. A revolution in platform lift design, the Slide-Away™ provides you the strength and durability only available in a dual-post lift, with the flexibility and interior room you need. 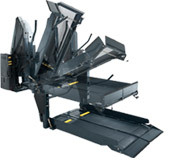 The KlearVue™ has a unique folding lift design which eliminates hazardous blind spots, providing an unobstructed view for drivers as well as passengers. Its compact design also means no modifications must be made to your vehicle's roof or door. The Reliant™ features a trim, compact design that allows you to make the most of your interior space, while its strong all-steel frame and powerful hydraulic pump ensure years of dependable use. The UNI-Lite™, which features 1/4"-thin platform and aluminum alloy construction, weighs only 160 lbs., yet it can easily lift as much as 600 lbs. 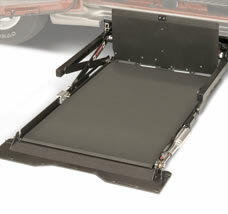 The BraunAbility UVL, or Under Vehicle Lift®, provides an innovative solution to your personal mobility needs. The mobility lift is mounted underneath the full-size wheelchair accessible vehicle, and is virtually out of site and out of the way until use of the lift. This design creates more interior space with easier access into the vehicle for friends and family. The lift is activated by the standard hand-held or operational remote control, and with one click of the button, the lift smoothly deploys from the underneath the vehicle. With its simple and smooth design, deploying and retracting your lift will come with ease and enjoyment as you enter and exit your wheelchair accessible vehicle. 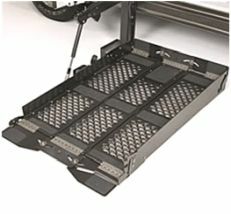 The UVL van lift’s safety features include a slip-resistant platform, automatic roll stop and an integrated manual backup system which allows you to safely get on and off the ramp. Your mobility freedom is just a push of the button away with the BraunAbility UVL van lift! • Threshold Sensor Mat: The CompanionVan RE is a great choice for individuals that travel with an attendant because of its manual door and manual bi-fold ramp feature. • Lifting Arms: The CompanionVan RE’s floor is lowered from the rear of the wheelchair van to just behind the front seats. Tie-down tracks and one belt system are included. • Hydraulic Power Pack: This feature allows for the two second row seats to fold down for ambulatory passengers, which leaves plenty of room for one wheelchair passenger. Fold up the seats and now you have a wheelchair van that can accommodate two wheelchair passengers. • Storage Compartment: The aluminum under-vehicle storage compartment is weather-resistant to protect these mobility lifts from the elements. • Optional Door Operations: The optional automatic door operators give you complete control of your mobility. 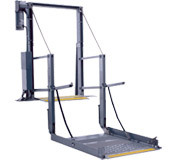 The doors can be opened and closed with all standard and optional van lift controls. 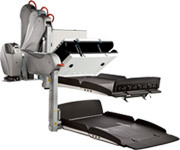 The UVL, or Under Vehicle Lift®, offers an innovative solution to your personal mobility. With the mobility lift mounted underneath the vehicle, it remains out of sight and out of your way until needed. This means easy access, a clear side view and maximum interior space—something your friends and family will appreciate on every trip. The BraunAbility UVL Series mobility lifts are electric in operation for both the in/out cycle and the outboard roll stop. The up/down cycle is hydraulic in operation. All functions are controlled by the standard hand-held control or the optional remote control. The UVL Series is designed for installation at the side door of domestic full-size vans. Installation of the UVL mobility lift requires modification to the van's drive shaft—consult Automotive Innovations for details. The UVL Series is VA accepted and fully NHTSA compliant.